Reviews of the Canon PowerShot SX510 HS from around the web. The Canon PowerShot SX510 HS is a 12 Megapixel super zoom camera with 30x stabilised optical range and a 3 inch LCD screen. Launched in August 2013 it replaces the one year old PowerShot SX500 IS which is retained in the PowerShot lineup. The SX510 HS is a step down in resolution from the 16 Megapixel CCD sensor in the earlier model, but the 12 Megapixel sensor in the SX510 is a back-illuminated CMOS type providing better low-light performance. 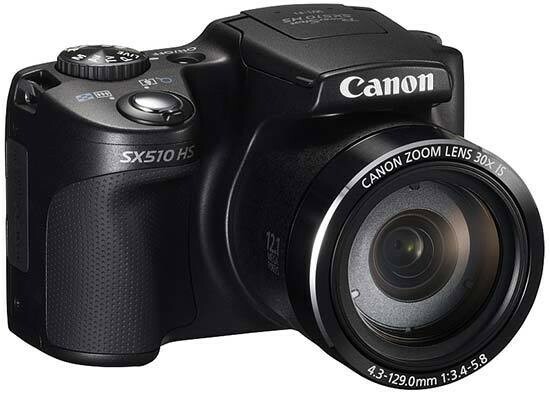 The Canon Powershot SX510 HS was announced in August 2013 and is a mini bridge camera with 30x optical zoom, updating the Canon Powershot SX500 IS. It has a 12.1 megapixel backlit CMOS sensor, full 1080p HD video recording and is available for around £250.